Artful Noise plays for a variety of events, both public and private. We book functions throughout the year, and work with event coordinators, agents, and private clients. If you are interested in having us play for your event, contact us by phone, email or our contact form. One of our quartet members will get back to you soon. Click on an image above or scroll down for more information about our services. 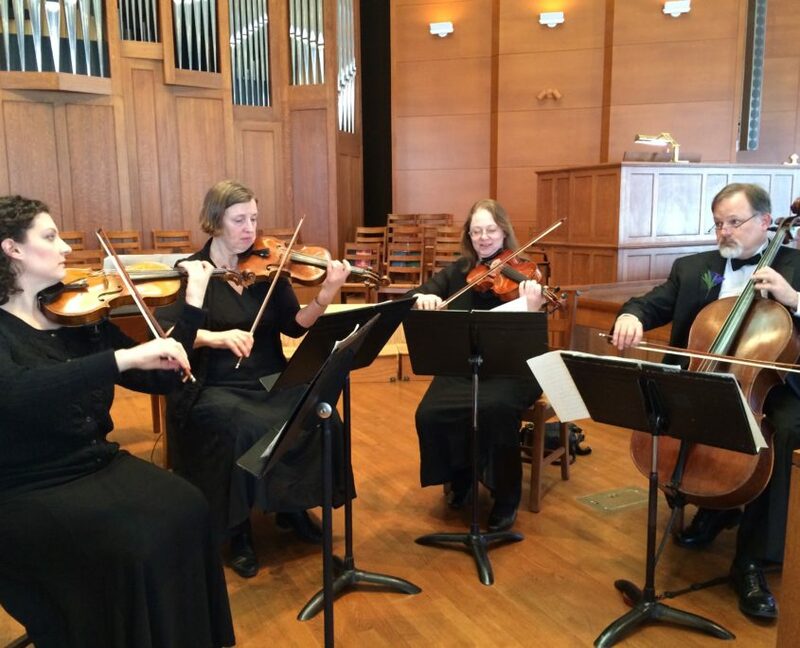 The Artful Noise String Quartet has played for hundreds of weddings in the New England seacoast region. We tailor our playlists for each couple and take the time to make sure your wedding music reflects who you truly are. From Pachelbel’s Canon and the traditional wedding marches to the Beatles and current songs on the radio, we are able to accommodate most requests. We are comfortable playing in many styles, and have an extensive repertoire of standard and popular string quartet music. 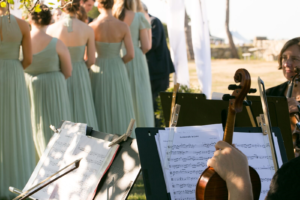 Our typical wedding package includes approximately a half hour of prelude music before the ceremony. This beautiful music sets the atmosphere for a romantic wedding, and provides entertainment for the guests. We then play the piece or pieces selected for the processional, any incidental music during the ceremony, and the recessional. We follow the ceremony with a few minutes of upbeat selections to celebrate the new couple’s union. Our services can extend to the cocktail hour and reception, when we can continue with classical repertoire or mix things up with romantic show tunes, jazz standards, and pop tunes. We take requests in any genre and can order or arrange music if it is not already in our library. Having played for so many weddings, all with slightly different playlists and ceremony options, we are fully comfortable with any wedding scenario and are able to make changes on the spot if necessary. 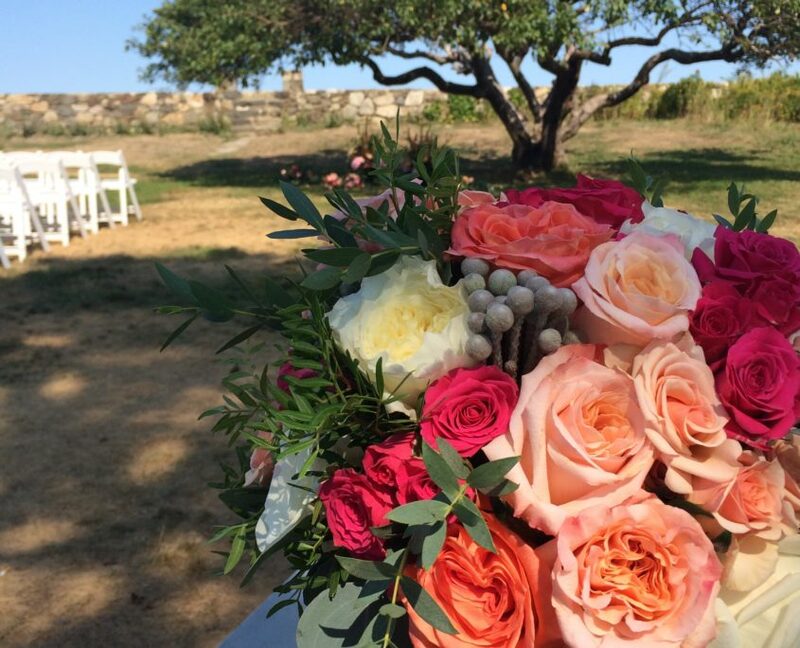 Our experience allows us to make quick decisions to keep the flow of the ceremony moving, and we can easily add extra music if the ceremony is delayed. We pride ourselves in timing the processional just right, and end our pieces gracefully to help smooth transitions. As an add-on to your wedding package, you can request that we bring our sound system to amplify the quartet to be heard over large crowds. Typically this is not needed for ceremonies, but it can be a big plus for large receptions in enclosed spaces. We also have a white wedding canopy available which we can bring for shade for outdoor ceremonies where no shade is already provided. In the months and days before the wedding, we are available for proposals, engagement parties and rehearsal dinners. Please contact us or fill out our performance inquiry form to find out about our availability for your wedding. 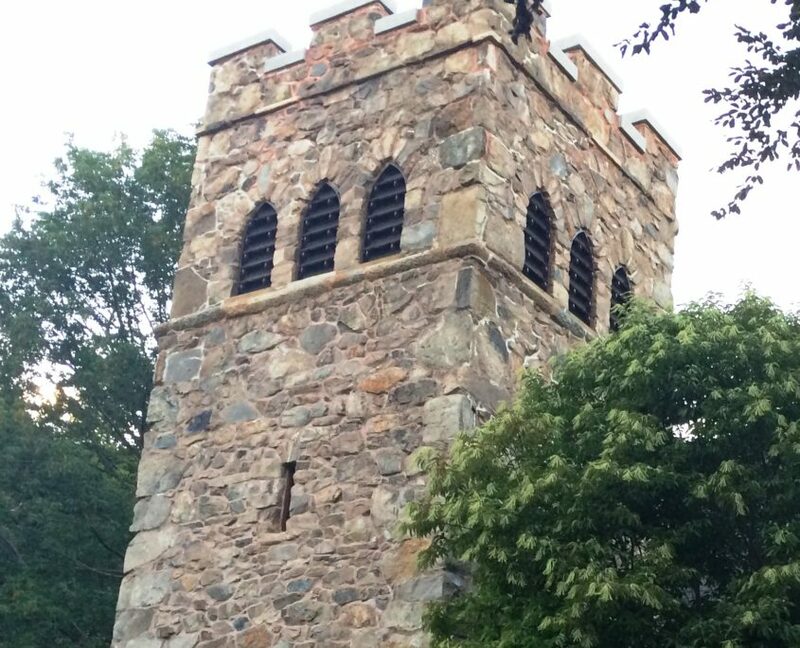 Artful Noise organizes and performs a classical concert series each summer in which we travel to several towns in the northeast and perform full-length concerts for the general public. We are featured as the classical string ensemble in many long-standing summer festivals and music series, and perform lighter fare for family concerts as well. Recent performances have included string quartets from Barber, Brahms, Bridge, Chadwick, Dvorak, Elgar, Rachmaninoff, and William Grant Still. In addition to our string quartet concerts, we collaborate with many larger choruses and ensembles on the Seacoast throughout the year. If your library, church or other venue is interested in having us join your concert series, or if you would like to book us for a private house concert, please contact us about availability. There are many events throughout the year in which we provide background music. Each event is different, and we work with our clients to choose just the right selections for the event. We are also available for studio sessions and work with composers on new string quartet material. Over the years, we have played in a variety of musical theater shows, and are available for large and small theater productions in the seacoast area. Our educational outreach program brings us into local schools where we give a short performance demonstrating the different instruments of the quartet, and can answer questions the students may have, as well as having an instrument “petting zoo” where children can try a stringed instrument. If you would like a quote for music at a special event, or would like to host us in your school, please use our contact form.